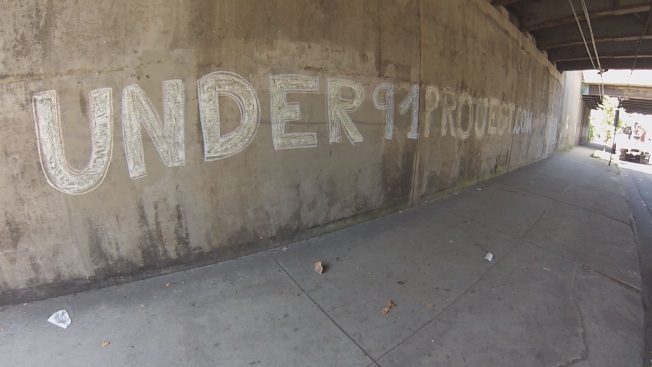 Walking along the underpass on Humphrey Street in New Haven is not impressive, but the "Under 91 Project" hopes to make the area bright and friendly. Starting in September, artists will begin to transform the space. “Each and every section of this bridge is going to have something for each and every individual in the community,” said the project's curator, a local artist named Dooley-O Jackson. The idea spun off from the 2012 Inside Out Project in New Haven, which featured photos of neighborhood faces. The Under 91 Project took submissions from local artists for a permanent display, and residents voted on a mural called "Bright Big Wall." “It's going to make you drive by and stop, and pull over, and say wow this is beautiful,” said Dooley-O. In the past, underpass artwork became the victim of vandalism at times. The Under 91 Project knows it's a possibility and is preparing for it. “We want to make sure this is actually a beautification. We want it to be kept nice, so one of the things we've done is incorporated maintenance of it into the budget. We know the artists we're working with are thinking about what it's going to be like if a part gets vandalized,” said New Haven Alderwoman Jessica Holmes. People walking through the area think it will do wonders for the space. “Probably bring more life to the street and community,” said New Haven resident Orlando Quintana. The Under 91 Project is still seeking funding. You can learn more about the project online.